Hi friends. Open this topic for analyze the Tarocco Siciliano. The Sicilian Trumps by Michael Dummett. The present harmless appearance of the Tower is also to be explained as an alteration made by the duchess Rosalia Caccamo. In a bit of the opuscolo which is now damaged and very hard to read, Villabianca says that in his youth trump 15 showed “il novissimo dell’... ”; the last word is illegible, and I am unsure what it could be. Villiabianca further says that the duchess had its subject changed into the Tower. Traditionally, trump 15 was sometimes known as “the House of the Devil” or “the House of the Damned”, and occasionally outright as “Hell”; Minchiate trump 15 shows a devil emerging to drag a woman down to hell. I suppose that it was something of this sort that the duchess replaced by the Tower as we now have it. Villabianca states that she paid the expense for the change of subject in trumps 14 and 15; I suppose that she paid cardmakers to make new wood blocks incorporating the new designs. The Devil was changed to a ship, the Tower card was changed to what Dummett called a harmless looking Tower, and the two changes were imposed at the same time. Dummett discovered and presented the Sicilian decks, the games played, and the history of both with his usual thoroughness. However, he didn't explain why those choices were made, i.e., the meaning behind the subjects. AFAIK, no one has. When Dummett says the Ship is easily explained, he refers only to the historical fact of the Devil’s replacement rather than its iconography. In referring to the replacement, Dummett noted "the subject substituted for it was evidently chosen arbitrarily from the Minchiate pack". (The Game of Tarot, 377.) The ship in the Minchiate deck symbolized one of the four Aristotelian elements, Water, which makes little sense as a replacement for the Devil. Likewise, he offers no explanation for the “harmless appearance” of the Tower. Both, however, can be explained. The Duchess was not the first to object to Tarot’s Devil and Tower cards. From the first century of Tarot there are many surviving examples of hand-painted cards, commissioned by nobles like the Duchess. However, only one hand-painted Tower survives, and no hand-painted Devil cards. This would be an extremely unlikely outcome unless these cards were either not produced or were at some point selectively discarded as even more undesirable than the other Christian subjects of the trumps. One of the most beautiful hand-painted playing cards is the ship embroidered with a motto from Horace: Odi profanum volgus et arceo, (Odes, Bk. iii, 1, 1). Ross Caldwell wrote (on trionfi.com) "This card was the subject of an article by Pierre-Yves Le Pogam in "The Playing Card", vol. 33 no. 1 (July-Sept 2004), pp. 27-38, entitled "Entre tarot et jeux de cour: une carte à jouer italienne" (Between Tarot Cards and Courtly Games: An Italian Playing Card)." Apparently two theories are presented to explain this card. One is that the card was Water, XXI, from a Minchiate deck. However, it seems likely that all Minchiate decks, with their large number of trump cards, were numbered, which this card is not. Also, the Minchiate hypothesis ignores both the meaning of the Water card and the motto on this card, making nonsense of both. Apparently this idea was rejected by the writer in favor of another. The second thesis appears to be the main subject of the article, judging from the title. It involves an elaborate speculation about a supposed "game" of supposed "cards" called the "Mantegna Tarots", and making some conflation of that (imagined) card game and appropriati. Given that the falsely so-called Mantegna Tarocchi were neither cards nor a game, this can be ignored entirely. The card itself cannot. As an alternative explanation, perhaps the Devil card was considered an example of the vulgarity of the profane hoi polloi, as rude as vulgar language and an offensive element in the game of Tarot. Perhaps in some locales, when the Devil was not omitted (or discarded) from the hand-painted decks, it was replaced with an emblem specifically designed to reject such vile things. The motto on the Ship card and thus the meaning of the emblem are clear: "I hate secular vulgarity and go away from it". Consider the baptismal formula: "Do you renounce Satan? And all his works?" This emblem is an answer to that: "Yeah, I turn my back to such things and leave them behind." Perhaps this emblem was precisely such a rejoinder, designed as a replacement for the Devil card which is present in the popular decks printed for mass markets but not in the hand-painted ones. It would be an anti-Devil card. The common yet versatile nature of a ship image should be kept in mind -- like the Tower, it can illustrate many different subjects. For example, it was repeatedly used by the emblematicists with a variety of meanings. Regardless of that speculation, as replacements for the Devil/Fire cards in Sicily, the Ship/Tower cards can be easily explained: Sicily is an island; threats come from the sea; watchtowers triumph over that threat. The tower depicted in the Sicilian Tower card is a short, fat building with sloping sides. Such guard towers formed a chain around Corsica and served as a symbol of "homeland defense" in the Mediterranean. Far from being harmless, they were considered so militarily formidable by Lord Nelson's British Navy, (those buggers who ruled the seas and remain legendary today), that the Brits adopted the practice of ringing their own coast with such fortifications after a particularly nasty encounter at Mortella Point, Corsica. Martello Towers -- those squat, circular buildings on lonely stretches of coastline -- have been part of the [British] seaside scene for over 150 years. This book -- the first of its kind -- describes how and why they were built, their history, and what they are used for today. Copied from a defensive tower in Sicily, the first Martello towers were constructed by the British at vulnerable points of the Channel coast when Napoleon threatened invasion in 1801. Later towers were built during hostilities first between the British and French in North America, and then between Canada and the United States. Strategically sited to protect potential invasion sites and vital installations, they survive in many places, in particular on England's south coast, in Ireland, the Channel Islands, the Orkneys, Canada, the United States and South Africa. The islands of Corsica, Sardinia, and Sicily, off the west coast of Italy, were apparently subject to raids by Saracen pirates dating back to the 1500s. Later, other sea powers active in the greater Mediterranean area, most notably the British, were a recurrent threat. That threat came in SHIPS. In response to that threat, the islands (most notably Corsica, under Genoese rule) were ringed with guard/watch TOWERS. Sicily being Sicily, i.e., a perennially threatened island kingdom, towers were important. In Corsica many of these (Genoese built) towers are still standing, more or less. Some have been adapted for other uses, but most are in ruins to one degree or another. These are almost all squat little round towers, many with tapered sides, built like tanks with walls many feet thick. Today they are of interest primarily to sightseeing tourists. Here are a couple picturesque examples from Corsica. More examples can be found simply by using Google and any two or all three of these keywords: genoese corsica towers. This kind of guard/watch towers are the subject shown on the Sicilian Tower card. The offending Tarot card was replaced with a related subject, a different kind of Tower card with no fire from heaven or fiery doorway. That replacement satisfied the Duchess' desire for a less offensive deck; it would not require the card players to learn and remember anything too novel; and it would be an emblem of local pride -- coastal guard towers. The Devil was replaced with the evil of foreign invaders, a ship, over which the Towers were to triumph. The ship is shown (like the Minchiate Water card, from which the design was taken) leaving, sailing away from the viewer or, by extension, away from Sicily. Again, that would satisfy the Duchess, it would be neatly paired with the Tower making the transition trivially easy for card players, and the two cards together convey a positive tale of the strength of Sicily. It's worth noting that the Florentine decks, most obviously the Minchiate, also redesigned a pair of cards in such a way as to maintain some continuity with earlier decks and yet tell a different story. The Florentine inversion switched the World and Angel; turned the New World of Revelation into a Eurocentric map of the Earth, indicating dominion over a very different New World (recently discovered by Columbus); and they turned the Angel of Resurrection into an allegorical Fama, trumpeting the triumphs of Florence, whose skyline is shown on the card. This is local pride on steroids! (The Medici coat of arms should also be noted, but we'll leave that for another post.) However, the same basic idea was present in all the local variations, most commonly seen in the change in sequence of trumps. Every locale wanted their own version of Tarot. That is why almost all of the early listings of the trumps are unique. Every locale had it's own version of Tarot, as a sign of civic pride. There are also some versions of the Sicilian Tower card that appear to show a lighthouse, (six-sided, gaudy) and there are also other examples of stubby towers. For example, an interesting image of a squat, tapered tower with concave sides appears in Jacob Bryant's _A New System: An Analysis of Antient Mythology_, (1st ed. 1774-6). The picture is supposedly an ancient fire-tower, identified with the mythical Tower of Cronus, in Monte Pelegrino, Sicily. (Bryant references Paolo Paruta as a source.) Bryant, writing at the same time as Court de Gebelin, was a similar sort of learned man: widely read, enthusiastic, inventive, fond of philological fantasy and generally untroubled by concerns of evidence and sound reasoning. One description of his book: "fantastic and now wholly valueless." Nonetheless, he provides an illustration of a supposed Sicilian lighthouse, rather similar to the Sicilian Tower card, and calls it the Tower of Cronus. (Extraordinary speculation has grown from far less suggestive beginnings, so I might pass it along in the spirit of Waite's Albigensian fantasy.) Despite that fantastic aside, such a tower -- a lighthouse -- might be a familiar landmark, even an identifying one. The territories of the kindom of Naples were similarly well defined, stretching from the border with the Papal States in the centre of the Italian peninsula to its southern costline. Within it were the regions of the Abruzzo, the Molise, and the Terra di Lavoro (the hinterland of Naples and Salerno) in its norther part, Puglia, Basilicata, and Calabria in the South. Less straightforward, however, was the formal title of the kingdom's ruler, which was not king of Naples. Instead the historic title was "king of the Sicilies", a title which covered both the Regnum Siciliae citra farum -- the kingdom of Sicily on this side of the lighthouse (of Mesina) -- and the Regnum Siciliae ultra farum -- the kingdom of Sicily beyond the lighthouse. The former designated the kingdom of Naples as already defined (the phrase "kingdom of Naples" was used even though the title "king of Naples" was not); the latter applied to the island of Sicily, likewise known as the kingdom of Sicily. John Robertson, The Case for The Enlightenment: Scotland and Naples 1680-1760, 2005. One of [Nelson's] fiercest fights was to capture a defence (Genoese-built) tower at Mortella point, manned by only a midshipman and 36 men. Admiralty reports of the event led to the construction of 74 so-called Martello towers at 600 yard intervals along the south coast of England from Folkestone to Eastbourne. It was ironic that Napoleon was to be kept at bay with the use of a Corsican defensive measure. One British response to the threat of Napoleon was to ring the English coasts with a series of heavily fortified observation towers. Over 200 of these towers were eventually built at enormous expense, not only on the British Isles, but in Australia, the West Indies and the Mediterranean. After the Napoleonic Wars some of the towers were demolished for building materials but many were dressed into service for storage and residence. While 43 towers survive in the British Isles, the most famous and the most frequently visited is the one outside Dublin at Sandycove. This was once the residence of James Joyce and is today a major James Joyce museum. So, beyond the simple notion of a ship triumphed over by a guard tower, there are a number of other possible connections with Tarot history as well as Sicilian history. We have two suggestions with regard to the origin of a Ship as replacement for the Devil, one that might precede Sicilian Tarot and have been borrowed in a different context, the other simply a replacement of the Devil with a more localized threat. Likewise, the Sicilian Tower might be either a lighthouse or, more likely, a coastal watchtower. The Ship/Watchtower interpretation is consistent with the images on the cards and with the facts of local history. In addition, these new meanings are consistent with the two recurrent practices in the evolution of Tarot symbolism: eliminating Christian content and proclaiming a local identity via the deck. I had always thought the reason of the Ship was to illustrate the Genoa ship that took the terrible outbreak of the Black Death to Sicily in 1656. Saint Rosalia was the Patron Saint of Palermo and performed the miracle of saving people from the Plague. I think yet in the Renaissance, they think the Black Death had arrived in Sicily by boat (I need check it). Saint Rosalia is also the Patron Saint of Seafarers and was known as something like Pharos di Torre or Sanctorium di Pharos in Messina. The Plague was called the black Death it is thought of the skin colouring, but now it is thought it is because it came from ships on the Black Sea. It was not called the Black Plague in Sicily it was called the Pestilence. An outbreak of plague at Messina in 1743 is important, not only for its fatality, but as one of the strongest cases in favour of the theory of imported contagion. Messina had been free from plague since 1624, and the Sicilians prided themselves on the rigour of the quarantine laws which were thought of have preserved them. In May 1743 a vessel arrived from Corfu, on board of which had occurred some suspicious deaths. The ship and cargo were burnt, but soon after cases of a suspicious form of disease were observed in the hospital and in the poorest parts of the town ; and in the summer a fearful epidemic of plague developed itself which destroyed 40,000 or 50,000 persons, and then became extinct without spreading to other parts of Sicily. History of the Black Death in 1900 Encyclopedia. To Add. Odi profanum volgus et arceo means 'I hate the unholy crowd, keep them away' arceo having the naval term to' stand off' from the shore. A good sumary of tarocco siciliano. G. Berti. Storia dei tarocchi. Mondadori. Milano, 2007. Pg. 65, 66. Scendendo ancora verso sud troviamo una noticia a Napoli, dove l’8 settembre 1482 un fabricante di carte chiamato Francesco Ricevette «3 ducati corrente prezzo di quattro trionfi e dieci paia di carte da gioco». Quanto alla Sicilia, i Tarocchi vi giunsero piuttosto tardi, stando alle notizie fornite da Francesco Maria Emanuele Gaetani, marchese di Villabianca. Introno al 1768 Gaetani scrisse un opuscolo intitolato Dei Giochi volgari in genere, in cui affermava che i Tarocchhi erano stati portati in Sicilia dal viceré Francesco Gaetani, duca di Sermoneta; costui governò sullìsola dal 1662 al 1667, ma per molto tempo visse a Roma, dove imparò a giocare a Tarocchi. Non fu comunque il viceré a decidere di ridurre il mazzo da 78 a 63 carte; lo testimonia lo stesso marchese di Villabianca, il quale nel suo opuscolo affermava che «giocandosi in tre si chiama gioco di tarocchini [...] perché si lasciano carte degli ultimi punti». Dunque, i Tarocchini siciliani erano ancora composti da 78 carte? La cosa non è chiara e sono sconosciuti sia il luogo sia il momento in cui si cominciò a stampare il mazzo con le caratteristiche note oggi. In compenso esistono vari documenti che attestano la diffusione dei Tarocchini siciliani. Per esempio, un bando di don Pietro de Castro, viceré dal 1735 al 1737, proibiva di vendere carte comuni e Tarocchi fabbricati fuori del Regno di Sicilia. Dunque, a quell’epoca le fabbiche di carte in Sicilia producevano sia mazzi di tipo ispanico-portoghese, una particolartità dovuta al fatto che l’isola era sottoposta ancora all’influenza della monarchia spagnola, sia i Tarocchi. Il manoscritto del marchese di Villabianca contiene un curioso aneddoto che spiega l’origine di alcuni cambiamenti alle figure dei Tarocchini siciliani. Il nobile spiegava che ai suoi tempi esistevano nel mazzo due figure che infastidivano i giocatori: il Demonio e il “novissimo dell’anima”, cioè la Torre folgorata, allora nota come l’Inferno. Per questo motivo la duchessa Rosalia Caccamo, evidentemente un’appsionata giocatrice, decise di far cambiare a sue spese quelle due figure, che diventarono così il Vascello e la Torre. Le sostituzioni ordinate dalla duchessa avvenero intorno al 1750. Si conosce anche un libretto non datato, risalente alla fine del Settecento intitolato Il gioco dei Tarocchi moralizzato, in cui si parlava del “gioco dei Tarocchi oggi molto frequente nella nostra città di Palermo”. L’anonimo autore, che si firmava con la sigla D.G.P., proponeva l’introduzione di nuovi soggetti affinché i giocatori potessero “fare acquisto della Virtù”, ma pare che i suoi suggerimenti non vennero messi in pratica da nessun fabricante. Dalla fine del Sttecento in avanti si conoscono diversi esemplari di Tarocchini siciliani. Al Museo Pitré di Palermo si conservano anche le matrici originali di un mazzo risalente agli inizi dell’Ottocento. Basta una sommaria analisi delle versioni sette-ottocentesche per capire che, mentre si evolveva la tecnica di stampa, l’iconografia restava quasi invariata. In practica le diverse aziende non fecero altro che modernizzare, di volta in volta, l’estetica del modello primitivo, ma non il suo contenuto. Tra i cambiamenti più significativi, oltre a quelli voluti dalla ducchessa Caccamo, va segnalata l’introduzione di una Palla al posto del Mondo, di Giove al posto dell Angelo del Giudizio, della Costanza al posto della Papessa; inoltre fu eliminato il Papa, probabilmente in segno di rispetto, e al suo posto venne inserita un’allegoria della Miseria. Il gioco dei Tarocchini siciliani continua a essere praticato in varie zone dell’isola, ma non esiste più una produzione locale. L’unica fabbrica attiva é, oggi, la Modiano di Trieste. Going down south to find a notice in Naples, where the September 8, 1482 fabricante a card called Francis received '3 ducats current price of four victories and ten pairs of cards. " How to Sicily, the Tarot came there rather late, according to reports provided by Francesco Maria Emanuele Gaetani, Marquis Villabianca. Gaetani Introno to 1768 wrote a pamphlet entitled Of Games vulgar in general, stating that Tarocchhi were brought to Sicily by the viceroy Francis Gaetani, Duke of Sermoneta; sullìsola he ruled from 1662 to 1667, but for a long time lived in Rome, where he learned to play Tarot. It was still the viceroy to decide to reduce the deck 78 to 63 cards, it shows the same Villabianca Marquis, who in his brochure stated that "played in three game called Tarocchino [...] because it leaves cards the last points. Therefore, the Sicilian Tarocchino were still composed of 78 cards? What is unclear is unknown and the place is the moment when we began to print the cards with the features known today. 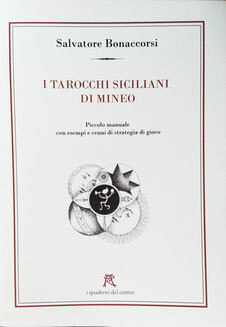 However there are several documents that prove the dissemination of Tarocchino Sicily. For example, a contract of Don Pedro de Castro, Viceroy from 1735 to 1737, prohibited from selling common and Tarot cards manufactured outside of the Kingdom of Sicily. So, at that time the Fabbica cards in both decks of Sicily produced Spanish-Portuguese type, a particolartità due to the fact that the island was still subjected to the influence of the Spanish monarchy, and the Tarot. The manuscript of the Marquis of Villabianca contains a curious anecdote that explains the origin of some changes to the figures of Tarocchino Sicily. The noble explained that in his time there were two figures in the deck that bothered the players: the devil and the "very new soul", that struck the tower, then known as Hell. For this reason, the Duchess Rosalia Caccamo, evidently un'appsionata player, decided to change its fees to those two figures, which became the Lieutenant and the Tower. Replacements avvenero ordered by the Duchess in 1750. We also know a book is not dated, dating from the late eighteenth century entitled The Game of Tarot moralized, which spoke of "the game of Tarot now very frequent in our city of Palermo. The anonymous author, who signed with the initials DGP, proposed the introduction of new players so that players could "make purchase of Virtue", but it seems that his suggestions were not put into practice by any manufacturer. Since the end of Sttecento forward several examples of known Tarocchino Sicily. Pitre at the Museum of Palermo is also preserved the original matrix of a deck from the early nineteenth century. Just a brief analysis of the seven-nineteenth-century versions to understand that while evolved the technique of printing, iconography remained almost unchanged. Practica in various companies did nothing to modernize, in turn, the appearance of the primitive model, but not its content. Among the most significant changes, beyond those intended by ducchessa Caccamo, it signaled the introduction of a ball instead of the World, Jupiter instead of the Angel of Judgement, of Constance in place of the Priestess, the Pope also was eliminated, probably a sign of respect, and in its place was inserted allegory of Poverty. The game Tarocchino Sicily continues to be practiced in various parts of the island, but there is more local production. The only active factory is today the Modiano in Trieste. Thanoscardgames (I don't know, who this is, it somehow seems to have cooperated with John McLeod) offers 3 bundles of free card games for playing (each bundle contains about 25-30 games). The realisations are not always perfect and it's all in a rather old state, but, nonetheless, the games work. Bundle 3 has a Tarocco Siciliano version. One can download the bundle, unzip the file, and install the games, one is interested in. I was interested in Tarocco Siciliano. Thanoscardgames offers a 3-players-version. It's not too difficult. The Computer dummies make some stupid moves during play. It's relative easy to win mostly under these conditions.